The colonial shutter is hinged at the sides and opens to the left and right of the window or door opening. It is held open by friction catches, shutter dogs or hook and eye hardware. When closed, it is secured in position by means of a horizontal "storm bar" secured to the shutter by machine screw and machine screw anchor. 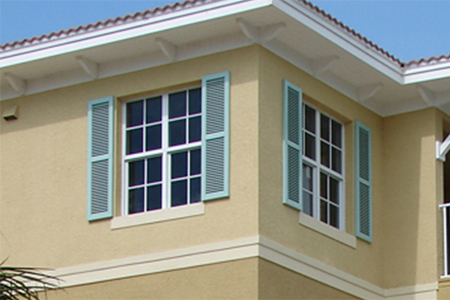 The all extruded Colonial Shutter is manufactured using 100% extruded materials and meets the most stringent hurricane code requirements in the industry. Along with storm bars, this system may be provided with an optional, integrated pin-latch system allowing for "tool-less" operation. Open louver refers to a ventilated panel composed of individual louvers used in series. This is in contrast to solid-backed or false louver systems that only give the appearance of an open style louver. In addition to the standard colonial louvered shutter, board & batten style, solid-backed, and fixed decorative panels are available upon request.